Adding a pocket onto the side of a pair of leggings is a great way to make them more functional. Stick your house key, a cell phone, and some cash in and you’re good to go whether it’s for a jog or for a night out on the town. The Citrus Leggings are a great pattern for adding in an extra pocket because they have a side panel. You can extend your pocket sides into the side panel seams making them extra sturdy. Rather than making a pattern piece, you can cut a rectangle the height you want your finished pocket to be + 1/2″ for seam allowances and wider than the width of View C side where you will be placing the pockets (since you can trim it down after basting it in place). 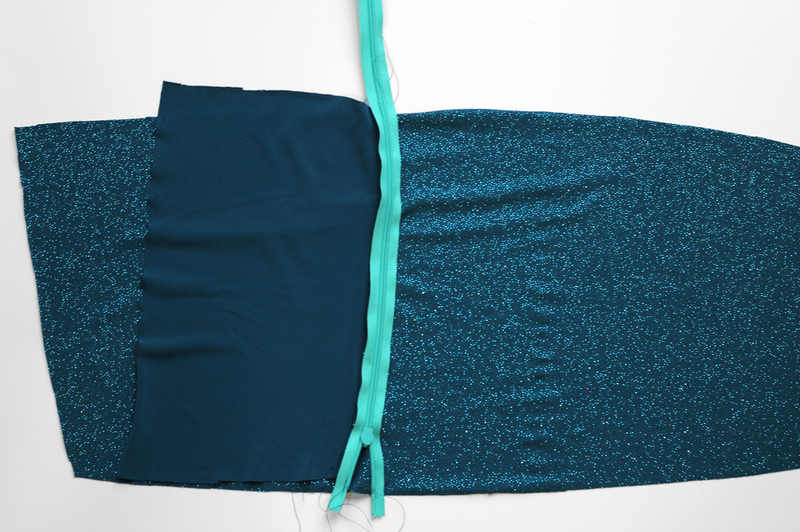 If you’re making Views A or B, you’ll want to sew your Side Front to Side Back and then add the pocket before sewing that side to the Front and Back. You can still measure on Side C because Side Front and Side Back A (or B) get sewn together to create the same pattern piece as Side C.
If you want to use an invisible zipper, sew one side to the top of your pocket. You’ll actually want to stretch your fabric a bit as you sew it to your zipper since the fabric stretches when you wear it (hint: use lots of pins. I didn’t quite stretch mine enough and you can see that it pulls the side seams in a bit where the zipper is on the finished garment). If you don’t want a zipper, fold the raw edge under and stitch it in place, making sure to use a stretch stitch. If using a zipper, sew the other side of the zipper to the leg. Again, lots of pins so you don’t stretch out the fabric as you sew. Flip the pocket down and secure it in place by folding the bottom up 1/4″ and stitching across the bottom (make sure you’re using a stretch stitch!). Baste the pocket to the leggings at the sides and trim off excess pocket fabric. Make sure that your zipper tab is pulled inside of the seam line for when you construct the rest of the leggings! Thanks to Minerva Crafts for supplying the dazzle jersey used in the photos!